Lars von Trier, yarattığı boyutta kendi özgürlüğünü eline alıp metaforları ile dehşet saçıyor. Antichrist, başından sonuna kadar hastalıklı bir zihnin ürünü olup olumlu anlamda çok büyük rahatsızlık veren bir film. Dafoe ve Gainsbourg ile resmen harikalar yaratıp neredeyse kusursuz olan filmini Andrei Tarkovsky'e armağan ediyor. Lars stages his inner anxieties through a manner that is openly explicit and beautiful. It’s a courageous work of art that desensitizes itself from commercial narrative or picture. You get the sense that this is in fact, the nightmare he saw. The misogyny, yet be disturbing and unattractive to viewers, draws out something profound about the evil nature in sexuality and gender. It’s something the open mind can wander with and absorb the worst or best of our deepest thoughts. 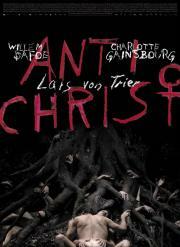 'Antichrist' is well documented as an exorcism of von Triers own anxieties by manifesting images from his tortured dreams. Gainsbourg's SHE then in many ways operates as his surrogate. Immersing herself into her ultimate fear- then realizing the evil she always loathed existed inside of her. The film, widely hated for its medieval misogyny, I felt was more of a chaotic juggle between the futility and destructiveness of both sexes in radically different ways. Raw material worth suffering through. I did not finish this- a 65 for the outstanding visuals. In typical fashion, Lars von Trier produces plenty of proactive scenes that will ruin your day, but somehow finds a balance through deep symbolism and breathtaking cinematography that is wrapped around a destructive tale of human nature.